I just love the silk scarf trend. There are so many fun ways to wear them and endless options of prints and patterns (some favorites here, here, here and here). The trend really satisfies my inner preppy, waspy self! You can see other ways I've worn them in this, this and this post. 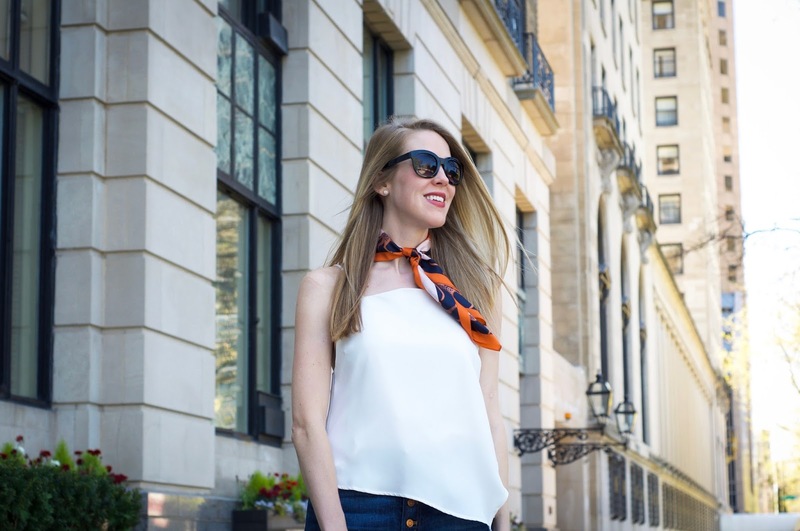 I paired my colorful neckerchief with this crisp white a-symmetrical tank from Tobi and it made for the perfect weekend outfit. Patrick and I have been busy packing for our move (we move into our new apartment on Saturday! ), but we made sure to take frequent breaks to get out and enjoy the weekend. Chicago is absolutely beautiful right now with abundant colorful flowers everywhere. Hope you had a great weekend. Thanks for reading!